The Droll Yankees Yankee Flipper is easily the most entertaining and effective method for foiling potential seed-stealing, bird-scattering squirrels. Now a staple of backyards everywhere, the Yankee Flipper captured the attention of bird enthusiasts and continues to be one of the best ways to keep squirrels away from bird feeders. The next time your furry friends try to sneak a bite when you're not looking, the Yankee Flipper will trampoline the rodent thieves away from your feeder with a comical and non-life-threatening toss. It works by using a weight-sensitive perch with a motor that twirls squirrels away. Sturdy stainless steel and a UV-stabilized polycarbonate 5 lb. capacity tube are combined together in one product for a stellar four-port bird feeder that will drive the squirrels bonkers with frustration! Keep your backyard birds safe from pilfering squirrels while saving money on bird seed in the process. Love it squirrels hate it. This is my second Yankee Flipper Feeder - the service was very fast. Would order from again. I have tried many "squirrel proof" feeders before but this one really works! I've had it for a year and the squirrels learn very fast that they will be thrown off, no more hogging the feeder for them. I just bought one for my daughter and she loves it too. This is absolutely the best bird feeder we have ever owned. In addition to the feeder, we purchased a baffle for the pole. The squirrels and raccoons are stymied, and have tried and tried to get to the feeder, to no avail. We haven't actually seen a squirrel get flipped, but that doesn't mean they haven't. The feeder holds a lot of bird seed, so that we don't have to constantly refill it. We had previously lost a lot of bird seed to the "critters", but no more. We love the Yankee Flipper. If you are looking to thwart squirrels, this is the only feeder that works, and I have tried them all. This is our third feeder. We love to see it "beat" the squirrels. 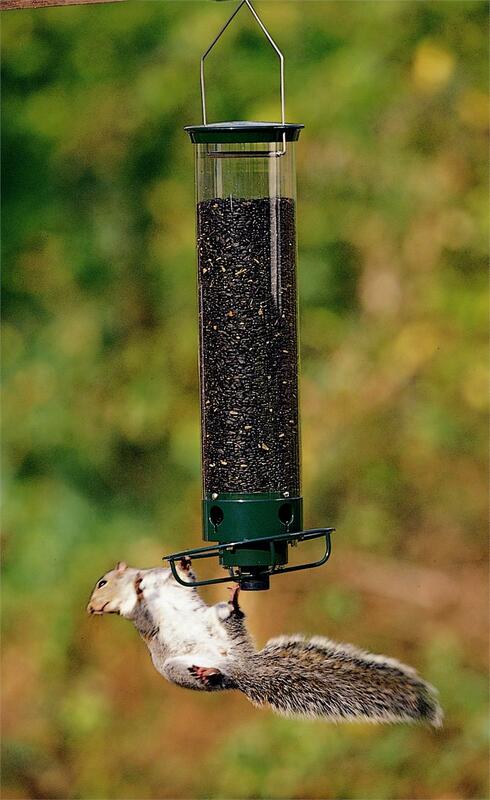 Undoubtedly the best bird feeder ever if you have squirrels any where near you. The birds get to feed and the squirrels get the ride of their life. Watched a squirrel one time go around about 25 times. They don't get hurt and you get real entertainment watching them and the birds. It really works. It keeps the squirrels and raccoons out. This is a great product. The squirrels stay far away. We are having an odd winter with very few birds around since fir trees are not producing cones this year, they have migrated to where there is food. The birds I do have seem to enjoy it and perch is too small for pigeons to land on -- perfect! I was concerned that the battery might not work in cold weather, but it works just fine. Also very easy to charge battery and hang feeder. We are so happy with them(2Yankee Flippers) that we got one for each of the in-laws. The amount of seed we saved is amazing. excellent..the squirrels after one or two tries learned that they could not beat the system and gave up trying..which allows the birds to eat in peace. I have four other feeders that the squirrels continually eat from and even chew up the plastic container. This is the second one I bought! It really works and it's fun to watch the squirrels flying off! This is the second one I have purchased and I think they are great although they cost a little more then I would like. 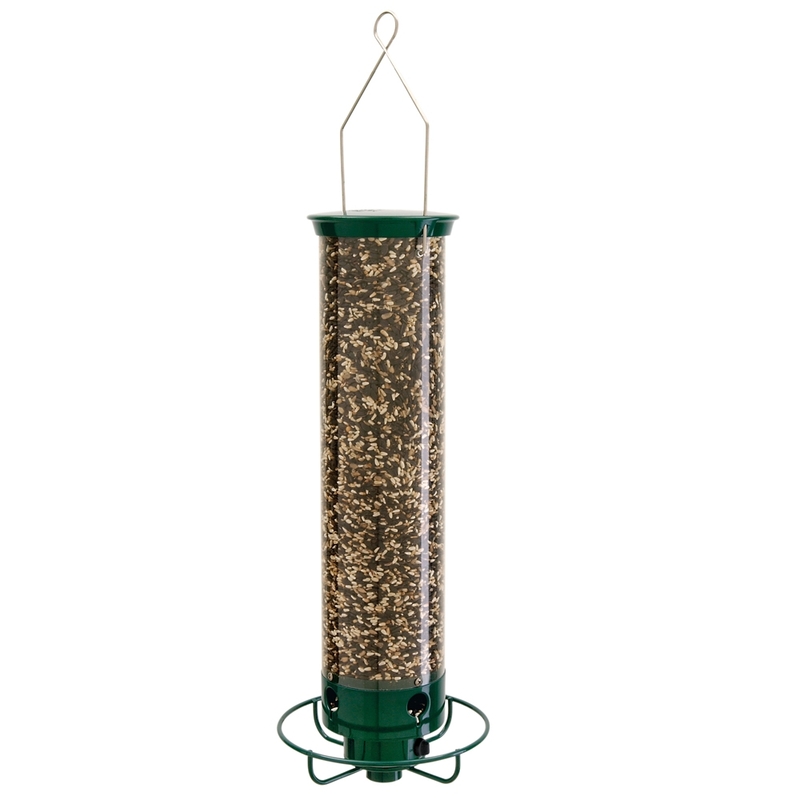 I have purchased two of these feeders and they work! The squirrels have quit trying because they got tired of being swirled off! Great Product! It was well worth the money and very entertaining! I now have squirrels who are gymnasts. I don't think the squirrels are very happy! I would definitely buy another Yankee Flipper. It works great and has lots of birds! I just love this feeder! All it takes is one time for the squirrels to get thrown off. Now they have to wait till the birds drop seeds to the ground. I really enjoy this item. It keeps just about any critter except raccoons and bears off. This is my third "flipper" and they are worth the expense! I believe they have a lifetime warranty also. This is my third flipper and I swear by them. It is a great invention and I strongly suggest if you have a squirrel problem, get one or several. Unfortunately, I've just had one ruined by raccoons. It is wonder if they will warrant this product against what they did to this flipper. I'm going to see if they will replace it. We love the feeder but our squirrels are so clever and they love it also. We had to take it down until later in the season, or until we find a different shepherds hook that will hang out farther. They hook their feet onto the pole, and stop the circle, thereby defeating the purpose. This is the second one we have owned. We wore out the other one. This feeder is the best you will ever own!!!! Squirrels get NOTHING out of this one no matter how hard they try - and they do try and try and try - I Love It!! Thank You Droll Yankees for the great product! It works like a charm. The rechargeable feature is nice to have! It works! I had one at my last house and it provided many hours of "entertainment". I just bought one for my mom and she loves it. I will soon be buying another one for my own home. The critters just cannot get into this one and gives them a delightful ride! Six squirrels ate my other brand new bird feeder into pieces. Their are tooth marks over the top of the Flipper, but no holes. My worker said he saw a squirrel get thrown off, hit a tree, and fall unconscious for awhile. I had to recharge it after a week, because the squirrels continued to make it turn and ran the battery down. By the second charging, they learned to leave it alone. Awesome feeder, a much better design than the original Flipper. Easy to clean, holds lots of seed, but would like the feeder to stand on its own to fill. Please fix that flaw and you will get 5 stars from me. Of course, the squirrels have marred the top trying to get in, so let's go stainless steel, please. Our birds don't seem to be fond of the feeder and I'm not sure why. Hopefully they will get use to it. I'm waiting for the squirrel to jump on it but he hasn't yet. It works okay but loses its charge a lot quicker than the first one we bought a few years ago. It is weight sensitive so the larger birds such as black birds and blue jays get flipped off which is okay as I have other feeders for them.